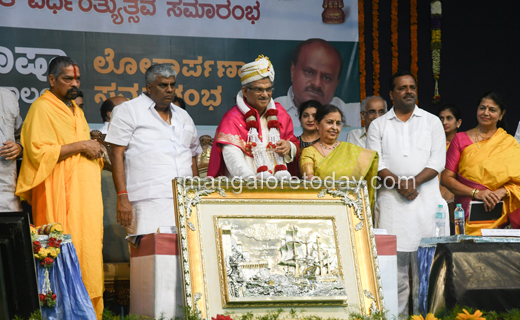 Belthangady, Oct 25, 2018: The newly constructed Manjusha museum at Dharmasthala was inaugurated on October 24, Tuesday by Dharmasthala Dharmadhikari Dr D Veerendra Heggade and his wife Hemavathi Heggade on the occasion of the 51st anniversary of Dr Heggade’s ascension as Dharmadhikari. A road development work costing Rs 23.5 cores taken up b y the PWD as part of the event was also launched on the occasion. State Minister for PWD HD Revanna who was present as a chief guest honoured the Heggade couple on the occasion. He informed that a sum of Rs 100 crore has been sanctioned by the Centre for the development of BC Road-Dharmasthala stretch and that the works would be taken up soon. DK District in-charge Minister UT Khader released a CD ’Chinnada Hejje’ while MP Nalin Kumar Kateel released Swami Darshana, a coffee table book,. 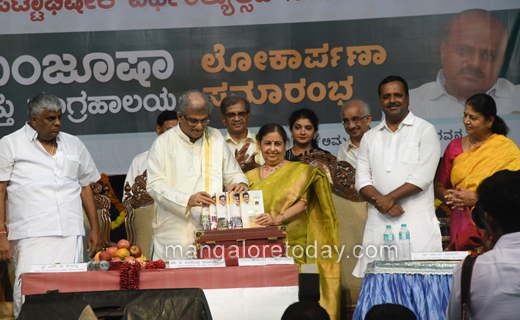 Special edition of Niranthara was released by local MLA Harish Poonja. Several dignitaries including Rajya Sabha Member Oscar Fernandes, MLC Harish Kumar, Belthangady TP Chief Divyajyothi, SP Dr Ravikanthe Gowda. Sridhama Manila Swamiji Sri Mohandas Paramahamsa and family members of Dr Heggade were present. Dr Heggade was earlier brought to the function venue in a procession. Speaking at the function Dr Heggade said a new high school would be started in Mangaluru, and a Naturopathy College in Nelamangala. The Ayurveda Hospitals at Hassan and Udupi will be developed, he informed.